- AJPW Budokan Hall (June 21, '85) = Tiger Mask II was beaten by the NWA International Junior Heavyweight Champion, Kuniaki Kobayashi. - AJPW Sumo Hall (August 31, '85) = Tiger Mask II won the NWA International Junior Heavyweight Title from Kuniaki Kobayashi. - AJPW Sumo Hall (October 21, '85) = Tiger Mask II, Terry & Dory Funk Jr won, via countout, over Chavo Guerrero, Terry Gordy & Billy Robinson. - AJPW Budokan Hall (December 12, '85) = Tiger Mask II & Haru Sonada fought to a No-Contest with Nobuo Honaga & Kuniaki Kobayashi. - AJPW Budokan Hall (March 13, '86) = Tiger Mask II was pinned by Riki Choshu. - AJPW Budokan Hall (June 12, '86) = Tiger Mask II, Mighty Inoue & Hata were beaten by Harley Race, Mil Mascaras & Shunji Takano. - AJPW Budokan Hall (July 31, '86) = Tiger Mask II defeated the Great Kabuki. - AJPW Budokan Hall (December 12, '86) = Tiger Mask II & Toshiaki Kawada won over Kuniaki Kobayashi & Shinichi Nakano. - AJPW Budokan Hall (March 12, '87) = Tiger Mask II, Takashi Ishikawa & Giant Baba defeated Rusher Kimura, Ashura Hara & Goro Tsurumi. - AJPW Budokan Hall (June 9, '87) = Tiger Mask II beat Brady Boone. - AJPW Budokan Hall (August 31, '87) = Tiger Mask II & Giant Baba took down Hiroshi Wajima & Takashi Ishikawa. - AJPW Budokan Hall (October 6, '87) = Tiger Mask II, Shinichi Nakano & Isao Takagi were beaten by Bruiser Brody & Moondogs Spot & Spike. - AJPW Budokan Hall (December 11, '87) = Tiger Mask II & Takashi Ishikawa won over Toshiaki Kawada & Samson Fuyuki. - AJPW Budokan Hall (March 27, '88) = Tiger Mask II & the Great Kabuki defeated Tommy Rich & Austin Idol. - AJPW Budokan Hall (June 10, '88) = Tiger Mask II, Shinichi Nakano & Takashi Ishikawa fell to Ashura Hara, Toshiaki Kawada & Samson Fuyuki. - AJPW Budokan Hall (August 29, '88) = Tiger Mask II & Shinichi Nakano were beaten by Jimmy Snuka & Johnny Ace. - AJPW Budokan Hall (December 16, '88) = Tiger Mask II & Jimmy Snuka won over John Tenta & Shunji Takano. - AJPW Budokan Hall (March 8, '89) = Tiger Mask II lost to the NWA World Heavyweight Champion, Ricky Steamboat. - AJPW Budokan Hall (March 6, '90) = Tiger Mask II pinned Kenta Kobashi. - AJPW Tokyo Dome (April 13, '90) = Tiger Mask II fought to a Draw with Bret Hart. - AJPW Budokan Hall (June 8, '90) = Misawa defeated Jumbo Tsuruta. - AJPW Budokan Hall (September 1, '90) = Misawa fell to Jumbo Tsuruta. - AJPW Budokan Hall (December 7, '90) = Misawa & Toshiaki Kawada won over Jumbo Tsuruta & Akira Taue. - AJPW Budokan Hall (April 18, '91) = Misawa was beaten by the Unified Triple Crown Champion, Jumbo Tsuruta. - AJPW Budokan Hall (June 1, '91) = Misawa pinned Terry Gordy. - AJPW Budokan Hall (September 4, '91) = Misawa & Toshiaki Kawada retained the All Japan World Tag-Team Titles, beating Jumbo Tsuruta & Akira Taue. - AJPW Budokan Hall (December 6, '91) = Misawa & Toshiaki Kawada lost in the finals of the 1991 Real World Tag League to Terry Gordy & Steve Williams, who gained the vacant AJPW Tag straps. - AJPW Budokan Hall (March 4, '92) = Misawa fell to the Triple Crown Champ, Stan Hansen. - AJPW Budokan Hall (June 5, '92) = Misawa & Kenta Kobashi were beaten by the AJPW Tag Champs, Jumbo Tsuruta & Akira Taue. - AJPW Budokan Hall (August 22, '92) = Misawa won the Unified Triple Crown, taking down Stan Hansen. - AJPW Budokan Hall (October 21, '92) = Misawa defended the Triple Crown, winning over Toshiaki Kawada. - AJPW Budokan Hall (December 4, '92) = Misawa & Toshiaki Kawada defeated Jun Akiyama & Akira Taue to win the 1992 Real World Tag League. They also gained the vacated AJPW World Tag-Team Titles. - AJPW Budokan Hall (February 28, '93) = Misawa retained the Triple Crown, beating Akira Taue. - AJPW Budokan Hall (June 1, '93) = Misawa & Kenta Kobashi fell to the AJPW World Tag Champs, Toshiaki Kawada & Akira Taue. - AJPW Budokan Hall (July 29, '93) = Misawa kept the Triple Crown, winning over Toshiaki Kawada. - AJPW Budokan Hall (September 3, '93) = Misawa defended the Triple Crown with a win over Steve Williams. - AJPW Budokan Hall (October 23, '93) = Misawa again retained the Triple Crown, beating Stan Hansen. - AJPW Budokan Hall (December 3, '93) = Misawa & Kenta Kobashi won the 1993 Real World Tag League, and the AJPW World Tag-Team Titles, winning over Toshiaki Kawada & Akira Taue. - AJPW Budokan Hall (March 5, '94) = Misawa & Kenta Kobashi beat Stan Hansen & Giant Baba. - AJPW Budokan Hall (April 16, '94) = Misawa, Kenta Kobashi & June Akiyama won over Stan Hansen, Giant Baba & Takao Omori. - AJPW Budokan Hall (June 3, '94) = Misawa kept the Triple Crown, defeating Toshiaki Kawada. - AJPW Budokan Hall (July 28, '94) = Misawa lost the Triple Crown to Steve Williams. - AJPW Budokan Hall (September 3, '94) = Misawa, Tamon Honda & Giant Baba took down Toshiaki Kawada, Akira Taue & Takao Omori. - AJPW Budokan Hall (October 22, '94) = Misawa & Stan Hansen won over Akira Taue & Kenta Kobashi. - AJPW Budokan Hall (December 10, '94) = Misawa & Kenta Kobashi beat Johnny Ace & Stan Hansen. Due to another team's loss during the night, Misawa & Kobashi won the 1994 Real World Tag League. - AJPW Budokan Hall (March 4, '95) = Misawa & Kenta Kobashi defended the AJPW Tag belts, winning over Steve Williams & Johnny Ace. - AJPW Budokan Hall (April 15, '95) = Misawa defeated Akira Taue to win the 1995 Champion Carnival. - AJPW Budokan Hall (June 9, '95) = Misawa & Kenta Kobashi lost the AJPW Tag Titles to Akira Taue & Toshiaki Kawada. - AJPW Budokan Hall (July 24, '95) = Misawa retained the Triple Crown, beating Toshiaki Kawada. - AJPW Budokan Hall (September 10, '95) = Misawa stayed the Triple Crown Champion, pinning Akira Taue. - AJPW Budokan Hall (October 25, '95) = Misawa continued to defend the Triple Crown, winning over Kenta Kobashi. - AJPW Budokan Hall (December 9, '95) = Misawa & Kenta Kobashi defeated Toshiaki Kawada & Akira Taue to win the 1995 Real World Tag League. - AJPW Budokan Hall (March 2, '96) = Misawa retained the Triple Crown, beating Gary Albright. - AJPW Budokan Hall (April 20, '96) = Misawa, Kenta Kobashi & Jun Akiyama fell to Toshiaki Kawada, Gary Albright & Johnny Ace. - AJPW Budokan Hall (June 7, '96) = Misawa & Jun Akiyama kept the AJPW World Tag-Team Titles, winning over Steve Williams & Johnny Ace. - AJPW Budokan Hall (July 24, '96) = Misawa, Jun Akiyama & Tamon Honda defeated Giant Baba, Giant Kimala II & Ryukaku Izumida. - AJPW Budokan Hall (September 5, '96) = Misawa & Jun Akiyama lost the AJPW Tag Titles to Steve Williams & Johnny Ace. - AJPW Budokan Hall (October 18, '96) = Misawa, Jun Akiyama & Jumbo Tsuruta fell to Giant Baba, Akira Taue & Dory Funk Jr.
- AJPW Budokan Hall (December 6, '96) = Misawa & Jun Akiyama lost to Toshiaki Kawada & Akira Taue, who won the 1996 Real World Tag League. - AJPW Budokan Hall (March 1, '97) = Misawa stayed the Triple Crown Champion, winning over Steve Williams. - AJPW Budokan Hall (April 19, '97) = Misawa fought to a Draw with Kenta Kobashi, then dropped two straight matches to Toshiaki Kawada, who won the 1997 Champion Carnival. - AJPW Budokan Hall (June 6, '97) = Misawa retained the Triple Crown by beating Toshiaki Kawada. - AJPW Budokan Hall (July 25, '97) = Misawa defended the Triple Crown, pinning Akira Taue. - AJPW Budokan Hall (September 6, '97) = Misawa stayed the Triple Crown Champion, winning over Jun Akiyama. - AJPW Budokan Hall (October 21, '97) = Misawa again retained the Triple Crown, beating Kenta Kobashi. - AJPW Budokan Hall (December 5, '97) = Misawa & Jun Akiyama lost to Toshiaki Kawada & Akira Taue in the finals of the 1997 Real World Tag League. - AJPW Asunaro Cup '98 (January) = Misawa & Satoru Asako competed in the league, which was won by Jun Akiyama & Takao Omori. - AJPW Budokan Hall (February 28, '98) = Misawa kept the Triple Crown by beating Johnny Ace. - AJPW Budokan Hall (April 18, '98) = Misawa won the 1998 Champion Carnival, taking down Jun Akiyama in the finals. - AJPW Tokyo Dome (May 1, '98) = Misawa lost the Triple Crown to Toshiaki Kawada. - AJPW Budokan Hall (September 11, '98) = Misawa defeated Maunukea Mossman. - AJPW Budokan Hall (October 31, '98) = Misawa won the Triple Crown from Kenta Kobashi. 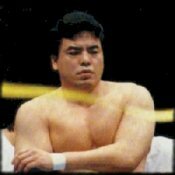 - AJPW Budokan Hall (December 5, '98) = Misawa, Yoshinori Ogawa & Masahito Kakihara beat Toshiaki Kawada, Akira Taue & Yoshiniro Takayama. - AJPW Budokan Hall (March 6, '99) = Misawa & Yoshinari Ogawa fell to the AJPW World Tag-Team Champions, Kenta Kobashi & Jun Akiyama. - AJPW Budokan Hall (April 16, '99) = Misawa, Yoshinari Ogawa & Masahito Kakihara defeated Akira Taue, Masao Inoue & Jinsei Shinzaki. - AJPW Tokyo Dome (May 2, '99) = Misawa defeated Vader and won the Triple Crown Title. - AJPW Budokan Hall (June 11, '99) = Misawa stayed the Triple Crown Champ, pinning Kenta Kobashi. - AJPW Budokan Hall (July 23, '99) = Misawa kept the Triple Crown by winning over Toshiaki Kawada. - AJPW Budokan Hall (September 4, '99) = Misawa defeated Yoshihiro Takayama. Later that night, Misawa was pinned by Vader. - AJPW Budokan Hall (October 30, '99) = Misawa lost the Triple Crown Championship to Vader. - AJPW Budokan Hall (December 3, '99) = Misawa, Yoshinari Ogawa & Satoru Asako fell to Vader, Johnny Smith & Maunukea Mossman. - AJPW Budokan Hall (February 27, '00) = Misawa was beaten by Jun Akiyama. - AJPW Budokan Hall (April 15, '00) = Misawa defeated Yoshinari Ogawa. - AJPW Budokan Hall (June 9, '00) = Misawa & Yoshinari Ogawa lost to Takao Omori & Yoshiniro Takayama. - NOAH Differ Ariake (August 5, '00) = Misawa & Akira Taue lost a "Three Falls" Match to Jun Akiyama & Kenta Kobashi. - NOAH Differ Ariake (August 6, '00) = Misawa & Yoshinari Ogawa defeated Kentaro Shiga & Daisuke Ikeda. - NOAH Differ Ariake (September 15, '00) = Misawa & Yoshinari Ogawa won over Masao Inoue & Akira Taue. - NOAH Great Journey (December 23, '00) = Misawa defeated Vader. - NOAH GHC Title Tournament (March/April '01) = Misawa won over Akitoshi Saito, Yoshinari Ogawa and Jun Akiyama to make it to the finals of the tournament. - NOAH Ariake Colliseum (April 15, '01) = Misawa became the first GHC Champion by beating Yoshihiro Takayama. - NOAH Budokan Hall (July 22, '01) = Misawa was pinned by Jun Akiyama, who won the GHC Title. - NOAH GHC Tag-Team Title Tournament (October '01) = Misawa & Yoshinari Ogawa lost to Takao Omori & Shinjiro Ohtani. Vader & Scorpio won the tournament. - NOAH Budokan Hall (February 17, '02) = Misawa & Kenta Kobashi fell to Jun Akiyama & Yuji Nagata. - NOAH Budokan Hall (September 23, '02) = Misawa won the GHC Title from Yoshihiro Takayama. - NOAH Budokan Hall (January 10, '03) = Misawa & Masa Chono fell to Kenta Kobashi & Akira Taue. - NOAH Budokan Hall (March 1, '03) = Misawa lost the GHC Title to Kenta Kobashi. - NOAH Budokan Hall (June 6, '03) = Misawa pinned Takuma Sano. - NOAH Budokan Hall (September 12, '03) = Misawa, Yoshinari Ogawa & Masao Inoue were beaten by Akira Taue, Daisuke Ikeda & Mohammed Yone. - NOAH Budokan Hall (November 1, '03) = Misawa & Takeshi Rikio defeated Naoki Sano & Yoshihiro Takayama. - NOAH Budokan Hall (January 10, '04) = Misawa & Yoshinari Ogawa won the Noah GHC Tag-Team Titles from Yuji Nagata & Hiroshi Tanahashi. - NOAH Budokan Hall (March 6, '04) = Misawa & Yoshinari Ogawa retained the Noah GHC Tag-Team straps, beating Mohammed Yone & Daisuke Ikeda. - NOAH Budokan Hall (April 25, '04) = Misawa & Yoshinari Ogawa stayed the Noah GHC Tag-Team Champs, defeating Naomichi Marufuji & Kenta. - NOAH Tokyo Dome (July 10, '04) = Misawa & Yoshinari Ogawa kept the Noah GHC Tag-Team Titles, winning over Keiji Mutoh & Taiyo Kea. - AJPW Battle Banquest (July 18, '04) = Misawa pinned Satoshi Kojima. - AJPW Keiji Mutoh 20th Anniversary Show (October 31, '04) = Misawa & Keiji Mutoh defeated Hiro Hase & Kensuke Sasaki. - NOAH Great Voyage '05 (January 8) = Misawa & Takeshi Rikio took down Genichiro Tenryu & Shiro Koshinaka. - NOAH Budokan Hall (March 5, '05) = Misawa & Kotaro Suzuki fell to Shinjiro Ohtani & Tatsuhito Takaiwa. - NOAH Budokan Hall (April 24, '05) = Misawa & Kotaro Suzuki lost to Minoru Suzuki & Naomichi Marufuji. - NJPW Tokyo Dome (May 14, '05) = Misawa & Tatsumi Fujinami defeated Masahiro Chono & Jushin Thunger Liger. - NOAH Budokan Hall (September 18, '05) = Misawa lost to the GHC Champion, Takeshi Rikio. - Wrestle-1 Yoyogi National Stadium Gym (October 2, '05) = Misawa & Yoshinari Ogawa beat Akebono & Scorpio. - NOAH Budokan Hall (November 5, '05) = Misawa pinned Genichiro Tenryu. - NOAH Budokan Hall (January 22, '06) = Misawa, Mushiking Terry, & Takashi Sugiura defeated Kensuke Sasaki, Katsuhiko Nakajima, & Mushiking Joker. - NOAH Budokan Hall (March 5, '06) = Misawa took down Takeshi Morishima. - NOAH Budokan Hall (April 23, '06) = Misawa & Yoshinari Ogawa beat Minoru Suzuki & Suwa. - NOAH Budokan Hall (July 16, '06) = Misawa & Jun Akiyama defeated Yoshihiro Takayama & Kensuke Sasaki. - NOAH Budokan Hall (September 9, '06) = Misawa & Yoshinari Ogawa took down Bison Smith & Keith Walker. - NOAH Budokan Hall (October 29, '06) = Misawa, Yoshinari Ogawa, & Kotaro Suzuki fell to Yoshihiro Takayama, Takuma Sano, & Takashi Sugiura. - NOAH Budokan Hall (December 10, '06) = Misawa won the NOAH GHC Heavyweight Title, pinning Naomichi Marufuji. - NOAH Budokan Hall (January 21, '07) = Misawa retained the NOAH GHC Heavyweight Title, beating Takeshi Morishima. - NOAH Budokan Hall (March 4, '07) = Misawa took down Takashi Sugiura. - NOAH Budokan Hall (April 28, '07) = Misawa stayed the NOAH GHC Heavyweight Champion, pinning Naoki Sano. - NOAH Budokan Hall (July 15, '07) = Misawa kept the NOAH GHC Heavyweight Title, winning over Akira Taue. - NOAH Budokan Hall (September 9, '07) = Misawa & Go Shiosaki fell to Tatsumi Fujinami & Osamu Nishimura. - NOAH Budokan Hall (October 27, '07) = Misawa retained the NOAH GHC Heavyweight Strap, pinning Samoa Joe. - RoH Glory By Honor VI, Night 1 (November 2, '07) = Misawa & KENTA fought to a 30-Minute Draw with Naomichi Marufuji & Takeshi Morishima. - RoH Glory By Honor VI, Night 2 (November 3, '07) = Misawa retained the NOAH GHC Heavyweight Title, taking down KENTA. - NOAH Budokan Hall (December 2, '07) = Misawa & Jun Akiyama beat Kenta Kobashi & Yoshihiro Takayama. - NOAH Budokan Hall (March 2, '08) = Misawa lost the NOAH GHC Heavyweight Title to Takeshi Morishima. - NOAH Budokan Hall (April 27, '08) = Misawa & Yoshinari Ogawa lost in the finals of the NOAH GHC Tag-Team Titles League to Akitoshi Saito & Bison Smith. - NOAH Budokan Hall (July 18, '08) = Misawa, Naomichi Marufuji, & Takashi Sugiura defeated Kenta Kobashi, Katsuhiko Nakajima, & Yoshihiro Takayama. - NOAH Budokan Hall (September 6, '08) = Misawa, Yoshinari Ogawa, & Takashi Sugiura beat Jun Akiyama, Atsushi Aoki, & Takeshi Rikio. - NOAH The Tournament '08 (December) = Misawa lost in the first round to Takashi Sugiura. Akitoshi Saito won the tournament. - NJPW Wrestle Kingdom III (January 4, '09) = Misawa & Takashi Sugiura fell to Hirooki Goto & Shinsuka Nakamura.